At Dr Anita Gallo & Associates, we help you every step of the way to select a look that makes you feel good. With a large selection of eye frames, we’re sure you’ll find what you’re looking for. The shape of the frame should contrast the shape of your face. The size of the frame should be in scale with the size of your face. The eyewear should repeat your personal best feature. For instance, a blue frame to bring out the colour of a blue-eyed individual. 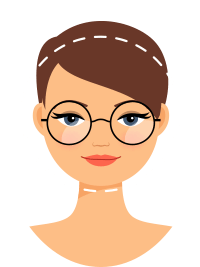 Oval – almost any style works for this face shape. Try frames as wide or wider than the broadest part of your face. Base Down Triangle (lantern jaw) – add width to your forehead by choosing styles that angle outward at the top corners. Try semi-rimless or other top heavy styles to balance the width of the jaw. Round – wider (but no wider than the widest part of the face) than deep frames are ideal to lengthen and narrow the face. Also choose angular styles. Rectangular style frames look great. 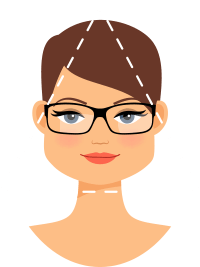 Inverted Triangle (Base Up Triangle) – minimize the upper portion of your face by selecting frames no wider than your forehead and angling outward at the bottom corners. Rimless styles will also work well. 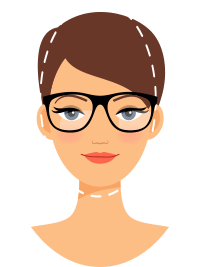 Square – try narrow (no wider than the widest part of your face) frames with softly curved styles (for example ovals) to soften the strong jaw-line and forehead. Frames should be wider than they are deep though. 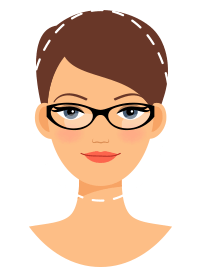 Oblong – this face shape is long and thin. Try frames with decorative feature to add more width. Shorten the face by choosing styles that extend beyond the widest part of the face and frames with more depth. Round, square or low-triangular shapes work well. If youʼre unsure which frame suites your face shape, come in to Dr Anita Gallo & Associates optometric office in Maple and we will be glad to help you!